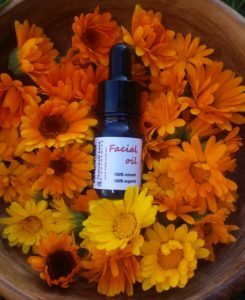 This is an introductory article on the awesomeness of facial oils I wrote recently for a larger online community with keen interest in all-things natural. I thought I’d share it with you too. We have seen various facial oils popping up on the market for years, but what are they? How are they different from creams or lotions? And why would you use them instead? Will they leave your skin look oily? All these are valid questions, so let’s answer them one by one. Facial oils are basically a blend of carrier oils (think macadamia, almond, olive, rosehip, coconut) or infused oils (my absolute favourite Calendula, Green tea, St John’s wort) enriched with essential oils. Some manufacturers add some other less natural ingredients like gliding agents, preservatives (tocopherol), fragrance, emollients (lecithin) and even parabens, however a good quality facial oil doesn’t require the addition of such synthetic ingredients because carrier/infused and essential oils love each other and mix beautifully together. Are facial oils different from creams or lotions? Cream = water + oils. While tipically a facial oil is 100% oils. A cream is about 30-40% water, with lotions scoring 60-70% water. Nothing wrong with water, but water and oil don’t mix together and that means you need an emulsifying agent to bind them together. And emulsifying agents are plain synthetic. Coming back to the water content in creams and lotions, another issue is that water is a good environment for bacteria to develop and that is why various preservatives need to be added to creams. The good news is bacteria doesn’t like oil. So if you are after a pure moisturiser, without synthetic ingredients or preservatives, your only bet is the oil. Plant-based oils that is, not mineral/petroleum-based oils. This gets us to our next question: why would you use facial oils? Because they can be 100% pure, natural. They are cost-effective – they come in small bottles because they go a long way, you only need a few drops at once. Oils are exactly what your skin needs for a healthy glow – the nourishing, moisturising and rejuvenating properties in a cream come from the oil content only, not from water. So why buy water so dearly? Last but not least, you can use a facial oil as a moisturiser, a toner and a cleanser. This saves time, money and bathroom shelf. Would facial oils leave your skin look greasy? Not at all! Facial oils are for everybody, not only for people with dry skin. They come in different formulations for various skin types and needs. From the rather heavy ones (like avocado or castor seed oil) to the lighter ones (like jojoba, which is actually a wax), there is a large range of nutrient-dense oils to suit every skin. The key is to massage the oil for a couple of minutes so it doesn’t just sit on top of the skin but penetrates deeper into the layers of the skin. And best is to use your facial oil on wet skin as the water will help the oil sink in quicker. Your face will feel fabulous then, no doubt!